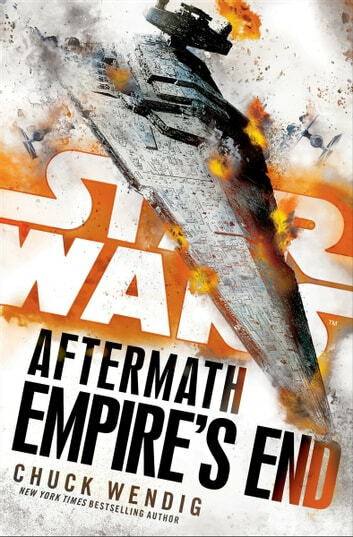 Following Star Wars: Aftermath and Star Wars: Life Debt, Chuck Wendig delivers the exhilarating conclusion to the bestselling trilogy set in the years between Return of the Jedi and The Force Awakens. As the final showdown between the New Republic and the Empire draws near, all eyes turn to a once-isolated planet: Jakku. The Battle of Endor shattered the Empire, scattering its remaining forces across the galaxy. But the months following the Rebellion’s victory have not been easy. The fledgling New Republic has suffered a devastating attack from the Imperial remnant, forcing the new democracy to escalate their hunt for the hidden enemy. For her role in the deadly ambush, Grand Admiral Rae Sloane is the most wanted Imperial war criminal—and one-time rebel pilot Norra Wexley, back in service at Leia’s urgent request, is leading the hunt. But more than just loyalty to the New Republic drives Norra forward: her husband was turned into a murderous pawn in Sloane’s assassination plot, and now she wants vengeance as much as justice. But Sloane, too, is on a furious quest: pursuing the treacherous Gallius Rax to the barren planet Jakku. As the true mastermind behind the Empire’s devastating attack, Rax has led the Empire to its defining moment. The cunning strategist has gathered the powerful remnants of the Empire’s war machine, preparing to execute the late Emperor Palpatine’s final plan. As the Imperial fleet orbits Jakku, an armada of Republic fighters closes in to finish what began at Endor. Norra and her crew soar into the heart of an apocalyptic clash that will leave land and sky alike scorched. And the future of the galaxy will finally be decided. Great finale to the trilogy, and easily the best read of the three. Empires End was a good end to a reasonable trilogy, Aftermath was simply avery poor effort, Life Debt was much much better and Empires End was good but far from brilliant. I enjoyed the back story to the First Orders origins, the Republic aspect less so especially Sinjir's love life which couldn't have been more forced if Chuck Wending tried! Overall a good finish to a trilogy that could have been so much better with another author at the helm. Talking of which Timothy Zahn's latest novel "Thrawn" is not to be missed with the title character being my favourite Star Wars villan ever, probably my Star Wars character ever! Not read it yet (not out for a couple of weeks at the time of this review) but I can guarantee it will be superior to this trilogy.